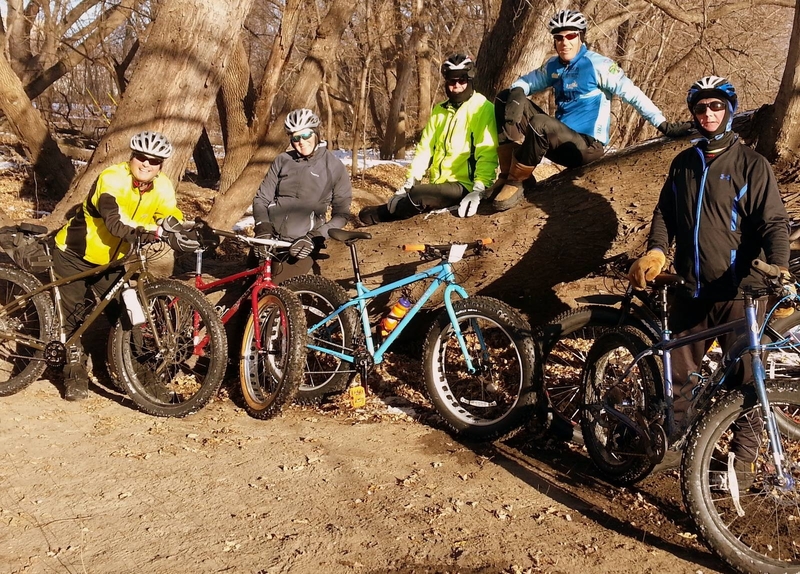 Despite the horribly warm & snowfree winter day, yesterday’s local Global Fat Bike Day ‪#‎GFBD2015 brought out two dozen riders for an afternoon 13-mile group ride around Northfield, culminating with snacks & refreshments at Downtown Bicycles. Props to CROCT member Christopher Tassava @tassava & Downtown Bicycles owner Tom Bisel for organizing & hosting this event. A fun ride to celebrate the greatest of all the winter holidays: Global Fat Bike Day 2015! #GFBD2015 is one of those contrived holidays that’s still a lot of fun: a day to get out and ride fat bikes in the conditions they love most – winter. Meet up at 1:30 at Bridge Square. Ride some of our fair city’s best fatbike terrain, like Sechler Park, the St. Olaf Natural Lands, maybe Odd Fellows or Lashbrook parks, and other points t.b.d. After about 90 minutes of riding, we will finish up with refreshments at Downtown Bikes – hot coffee from our friends at Stoke, cold beer from some local spots, and other tasty treats. A. This is all for fun! Everyone is welcome as long as they have a fat bike or a tough enough MTB to handle the conditions – kids, beginners, recreational riders, experts and racers. Feel free to invite “outsiders,” but make sure they know that they’re then obliged to ride our trails a least once a month for the rest of their lives. B. We’ll hang together so that nobody gets dropped, though if the group’s big enough, riders might sort themselves out into faster/further and slower/closer. The route will be easy to follow so it’ll be easy to cut if or when your bike gets tired and needs to go home. C. This ride will happen in rain, snow, sun, or shade, because fat bikes! Saturday, December 5, 2015 from 1:30 PM to 3:00 PM (CST).